Yet another artist taken from us in April 2017 was Brenda Jones, one of the three sisters who made up The Jones Girls. Unfortunately, Ms. Jones was struck and killed by an automobile while crossing the street on April 3 or 4 (depending on the source), while she had been in Wilmington, Delaware, visiting her daughter. 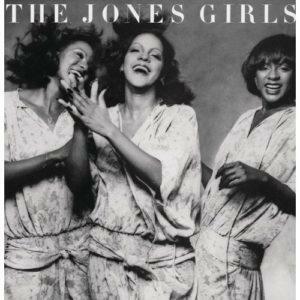 The Jones Girls (Brenda, Shirley, and Valorie) had had some success singing backup for other singers (such as Diana Ross) and had released some singles of their own in the early to mid-1970s, but with little chart success. In the late 70s, they changed record labels to Philadelphia International and finally released their first LP, the self-titled The Jones Girls. The first single from the album, “You Gonna Make Me Love Somebody Else”, was a straightforward song about a woman lamenting the way her mate is treating her. The single entered Billboard’s Hot 100 at #87 for the week ending June 23, 1979 (chart | magazine); it peaked at #38 eight weeks later (chart | magazine). The next week, it had fallen back out of the Top 40, and two weeks after that, it was out of the Hot 100 entirely. The single did better on what was then called the Hot Soul Singles chart, peaking at #5 on July 14 (chart | magazine) amid a 22-week run. The RIAA certified the single as gold on August 30, 1979. Interesting, even though the song never charted for The Jones Girls, it is another track from the album, “Who Can I Run To”, which is probably best remembered by many who remember the group. The B-side to “You Gonna Make Me Love Somebody Else”, it was covered in 1995 by Xscape, yielding a #8 Pop (#1 R&B) hit. As for The Jones Girls, they continued to place singles on the Hot Soul Singles chart, though they never again hit the Hot 100. (According to the always-reliable and not-sourced-in-any-way-in-this-case Wikipedia*, the group’s #23 (Soul) single “Nights Over Egypt” currently gets more airplay than previous singles.) After a fourth album did not show much success, the group disbanded in 1984 (though they occasionally got back together to record or perform). Shirley Jones pursued a solo career that produced the single “Do You Get Enough Love”**, which hit #1 on the R&B chart, which by then had changed its name to Hot Black Singles. In 2001, Valorie Jones passed away at the age of 45, due to what was termed “natural causes” but which appears to have actually been complications from alcoholism (per this thread). Shirley and Brenda both continued to perform, though not usually together. As stated above, at least one track by The Jones Girls still gets some airplay. As for “You Gonna Make Me Love Somebody Else”, their lone Top 40 hit, the only place I have heard it on the radio is via Barry Scott’s “The Lost 45s”. It would be nice to hear it a little more. * In case it hasn’t been mentioned enough on this site, the author is not a fan of Wikipedia as a source. Your mileage may vary. ** Amazingly enough for a #1 (Black) single, this song isn’t available as an MP3 download.